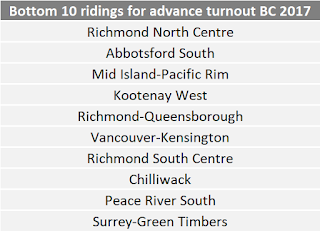 Election BC has released the data for the full 6 days and the turnout is really high. It's difficult to compare directly with 2013 mostly for two reasons. First of all, there were fewer days to vote in advance 4 years ago (including fewer weekend days). Secondly, advance turnout has increased systematically over the last 10 years. So, can we expect an increased turnout for Tuesday? Let's look at the numbers. 614,389 citizens in BC have already cast their ballot. This is already much more than the 366,558 of 2013. The 614k this year represent 19.5% of registered voters. For comparison, the advance turnout (among registered voters) was only 12% in 2013. 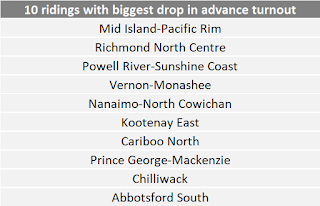 Election BC shows the upward trends. Advance voters represent a bigger and bigger fraction of the total voters every election. If the overall turnout this year remains the same as in 2013, it means advance voting will have represented 34% of all the voters, a jump from four years ago (20.34%). A jump so big that a constant overall turnout appears unlikely. But again, we can simply extrapolate linearly since this year had so many more days available to vote early. Ok, let's try to adjust the data. Based on the advance voting data from this year and 2013, turnout during the weekend seems to be significantly higher than during the week. Specifically, the number of early voters on Wednesday, Thursday and Friday was, in average, 89.9k in 2013 and 85.4k in 2017. As for the weekend, it was 111k in 2013 (only one Saturday) and 119.4k in 2017 (two Saturdays, one Sunday). If we adjust the number of early voters of 2013, we get 602,000, not that far from the 614k from this year. 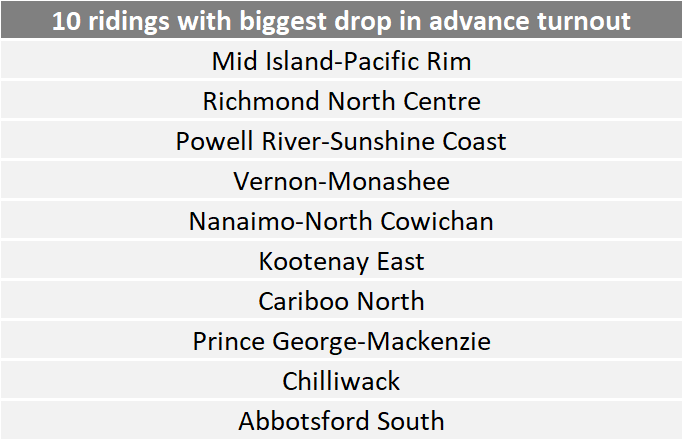 This means an adjusted advance turnout of of 19%, just below this year. So it is well possible that more people voted early mostly because there were more opportunities (=days) to do so. Also, given the trend of people to vote early more and more, I think that the safe bet is for the overall turnout to be similar to the one in 2013. It might even be slightly lower! I personally think it'll be a little bit higher because this election has more close races, including 3-way races. But I don't think the data about early voting suggest a giant turnout increase like for the 2015 federal election. Of course, remember that the comparison was hard and I had to make adjustments. 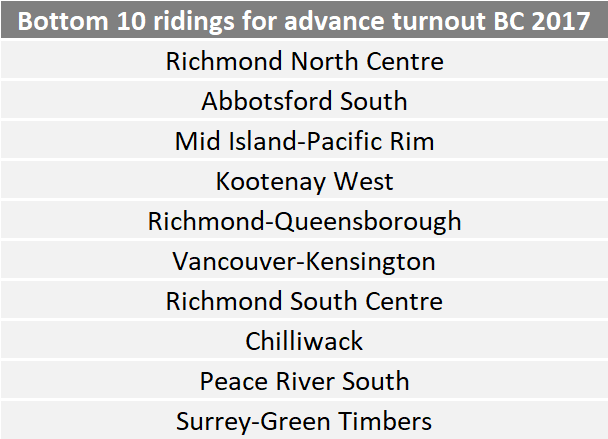 Anyway, let's look at the advance turnout by riding for this year. 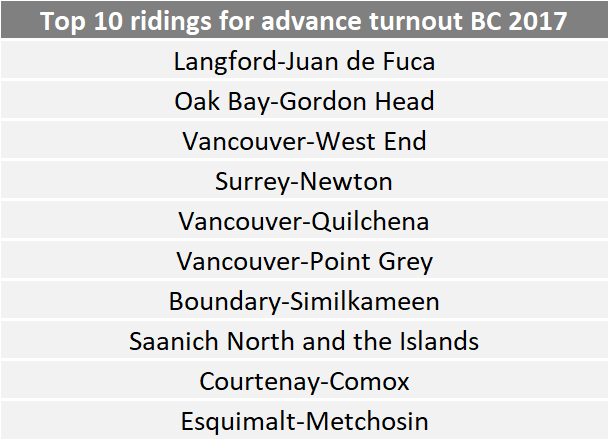 Also, here is the top and bottom 10 ridings for where advance turnout increasesed, respectivley, the least and most. This second measure is important because some region/ridings have higher turnout no matter what and the two lists above might not be indicative of anything. Maybe the real indication of where surprises will happen is the change in turnout. Edit: using the term "drop" was wrong. It's more the smallest increase as only one riding actually decreased. Can we find any pattern? 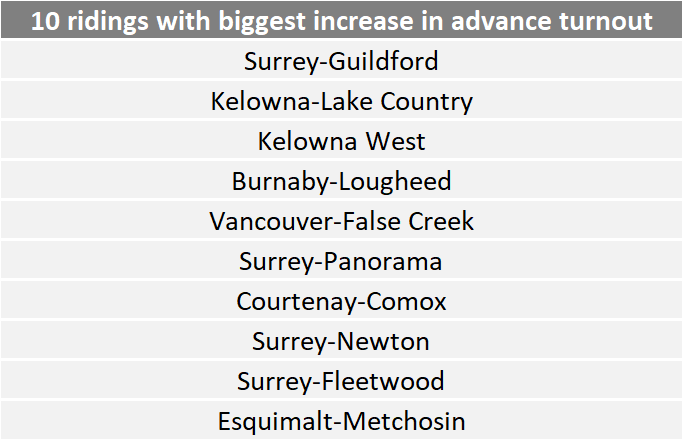 Well, if we look at the changes, it seems turnout is rising in Surrey (4 ridings out of 10 = there are 9 ridings in Surrey in total). This is a fast growing city with a diverse and changing demographic. This was also one of the regions to go, overall, against the provincial trend last time with the Liberals actually increasing there. There is also a new riding. Esquimalt-Metchosin is maybe representative of the fact the Island is a real battleground with all three parties in the race (remember that both the projections have shown this riding to be hotly contested). 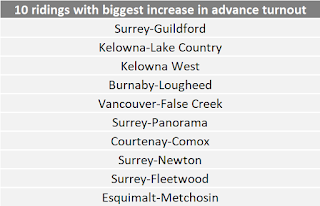 7 of the top 10 increases are in the Lower Mainland. As for the bottom 10, 5 are in the interior. If we instead focus on the actual levels (not changes), we see really high advance turnout on the Island, in particular in the region around Victoria where the Green can win seats. Is it a good sign for the party of Andrew Weaver? Maybe, although the increased turnout could simply be because all parties know these ridings are contested and they are getting the vote out. 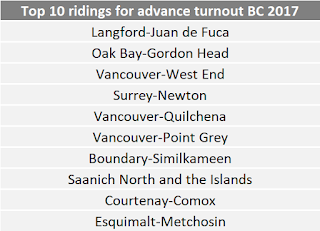 In 2013, in the 11 ridings where the Green had increased the most (10 on the Island + Nelson-Creton), the turnout had increases in average by slightly more than the provincial average, nothing really significant. Even if we focus on the top 5 we still don't find that the turnout increased more where the Green increased the most. So there is no guarantee that the high turnout in these ridings will actually help the Green party. At the end of the day, I admit that I'm not fully sure how to interpret this data or how to incorporate it in my projections. I'll say that the fact that, once adjusted for the number of days, overall turnout could be similar is a good news for me. Polls and projections are usually more accurate when it's the case. So maybe take these lists and remember these ridings as the one where surprises could happen (compared to my projections).